We write about movie memorabilia auctions quite a bit around here, from Michael Keaton’s original Batsuit, to the jacket Patrick Swayze wore in Dirty Dancing. But few of these offerings have ever managed to fill us with the clawing, insatiable need to get in there and Buy That Thing that’s currently brewing in our hearts, courtesy of a new sale written up by The Hollywood Reporter. What’s causing our sudden case of avarice? 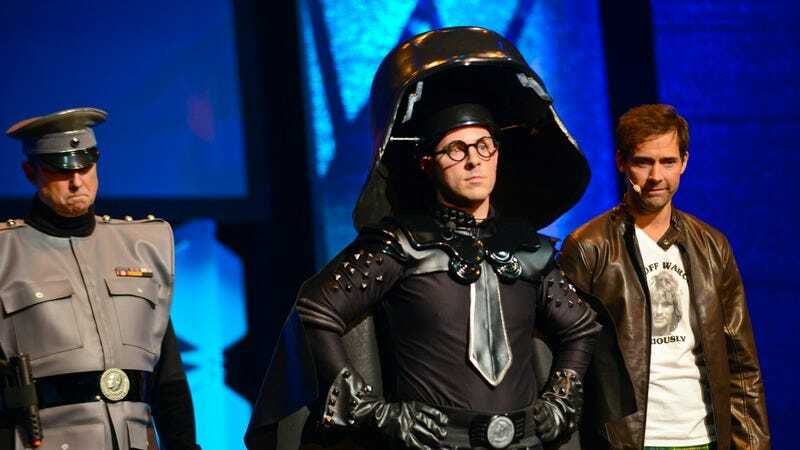 A couple of items from Mel Brooks’ classic Star Wars spoof Spaceballs, including the Dark Helmet helmet worn by Rick Moranis in the 1987 film. Besides making us wonder where we might be able to score a couple extra tens of thousands of dollars, the sale also makes us a little sad that there’s not more Spaceballs merchandise out in the world. Where’s Spaceballs: The T-Shirt? Spaceballs: The Towel? Spaceballs: The Flamethrower? At least we know we can find our own Schwartz rings: a box of Cracker Jacks (or, y’know, Etsy, if you’re feeling desperate).